Prominent Egyptian blogger and activist Alaa Abdel Fattah was summoned today to Cairo’s notorious C28 military prosecution headquarters to face charges of incitement to violence in the violent 9 October Maspero clashes between Coptic-Christian protesters and military police. Abdel Fattah, who rejects the notion of civilians being tried by military courts, has refused to be interrogated by military prosecutors as a matter of principle. He has also vociferously criticised the idea that the military prosecution should investigate the Maspero clashes, in which military police were directly involved. As a result, the military prosecution ordered his detention for 15 days pending investigation. Abdel Fattah is considered one of Egypt’s pioneer bloggers, along with his wife, Manal Hussein. Since 2004, both have been publishing their political opinions in well-known blog www.manalaa.net. Originally, as a software developer and activist, Abdel Fattah has supported initiatives that promote social media, freedom of expression and political activism. In 2005, Alaa and Manal won the Special Reporters without Borders Award in Deutsche Welle's Best Blogs competition. It is not the first time Abdel Fattah finds himself facing allegations by the state. In May 2006, he was arrested while participating in a peaceful protest in solidarity with Egypt’s free judiciary movement. His arrest caused an international uproar, as it was seen as an attempt to crack down on blogging activity in Egypt by targeting one of its most influential bloggers. Abdel Fattah was eventually released in June 2006 after 45 days in detention, during which an international campaign was launched on blogs and on Twitter with the hashtag “#FreeAlaa” – a hashtag that again found its way to many Twitter accounts following news of his latest detention. Born in 1981, Abdel Fattah was brought up in a family of leftists with a long history of political activism. His father, Ahmed Seif El-Islam Hamed, is a prominent lawyer and human rights activist who used to run the Cairo-based Hisham Mubarak Law Centre. Ahmed Seif El-Islam was arrested in the 1980s and imprisoned for five years for his political activity. Abdel Fattah’s mother, Laila Soueif, is a professor of mathematics at Cairo University, while his aunt is Ahdaf Soueif, an Egyptian novelist of international renown. Alaa’s sister, Mona Seif, meanwhile, is one of the founders of the “No to military trials for civilians” campaign. Abdel Fattah’s wife, Manal, also comes from a family with a long activist pedigree. Manal’s father is Bahi El-Din Hassan, a founder of Egypt’s contemporary human rights movement and current head of the Cairo Centre for Human Rights Studies. Abdel Fattah and Manal moved to South Africa in 2008, where they lived until January of this year, when they took the first flight to Cairo to join Tahrir Square protesters as the revolution erupted. His first day in the square coincided with what has become known as the “Battle of the Camel,” when pro-government thugs attacked demonstrators, leaving dozens dead. 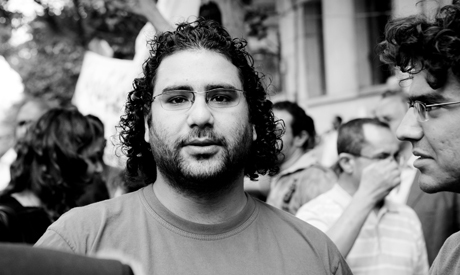 "Alaa fought bravely to defend the square and was never worried that he might lose his life," said Wael Khalil, prominent blogger and leftist political activist imprisoned with Abdel Fattah in 2006. Following Mubarak’s ouster and concomitant promises of democratic transition, the couple decided to return to Egypt on a permanent basis. Through their twitter accounts, “@alaa” and “@manal,” the couple announced their intention to have a baby. The baby, they noted, would be named Khaled after Khaled Said, the young man from Alexandria beaten to death by police last year who became a posthumous icon of Egypt’s revolution. The last thing Abdel Fattah wrote publicly, in independent daily Al-Shorouk, was his eyewitness account of the Maspero clashes and the two days spent at a Coptic hospital morgue battling for autopsy reports. He also spent this time mourning the death of Mina Daniel, the Coptic activist who was run over by military police during the clashes. "When will the SCAF understand that many revolutionaries are afraid of their tender loving mothers more than they fear death or torture," Abdel Fattah wrote in Al-Shorouk. Le peiple egyptien doit soutenir la cause juste et loyal la position de ALAA. Tous les jeunes qui ont ete victime de l'incident de Maspero nous devrions tous lutter pour eclaircir leur point de vue, liberte, egalite. Egypt needs People like him.God bless him. Why don't you [SCAF], for example, say like Voltaire did, I'm citing from my memory: "I don't share your views but I'm prepared to die in order to protect your right to present them." in the end every second hand arrival person to the 25th january will tell,he was a hero and at the final end,shara will rule and this once great country will starve and its citizins will be dwarfed by idiotic religious battles while the smart people make money out of your poverty wake up!!!! !